Since the 1960s, elaborate histories of Western and Axis air squadrons from WWII have been readily available to modelers and aero-historians. There is little about JG 54, for example, that cannot be repeated by local “experten” at the typical IPMS club meeting. But outside the names of a few famous aces, Soviet wartime aviation is still terra incognita. This new book by Antipov and Utkin is a lavish, meticulously-researched effort to popularize one of the best Soviet fighter regiments of WWII. The result is one of the most enjoyable aviation references I’ve seen in many years. For the uninitiated, the 812th Fighter Air Regiment (IAP) saw action against the Germans from July 1942 until Victory in 1945; this volume covers the combat history of the unit until 1944, when the enemy was pushed from Soviet territory. The next volume will detail offensive operations into Eastern Europe and Germany itself. The squadron emblem, a winged, white star containing a hammer-and-sickle, placed on the lower forward cowling of fighter planes, will be familiar to many modelers of WWII Soviet aircraft. But this book will introduce you to the flesh-and-blood airmen who sat in the cockpits of Yak-1’s, -7’s and -9’s and fought for their lives and homeland against the most ruthless invaders in human history. It is a story well worth telling and one well-told in this book. “Dragons” would be interesting for the poignant biographies of the aircrew alone, but the colorful, detailed maps, never-before-published period photos and incredible illustrations make this a fabulous reference. Special mention should be made of the full-color aircraft profiles, by Terry Higgins. These are among the most beautiful and well-researched aircraft illustrations I have ever seen and cover both the Soviet fighter types of the 812th IAP and their Luftwaffe opponents. This thick, soft cover book has all 150 pages packed with useful reference material for the modeler and aviation enthusiast alike. 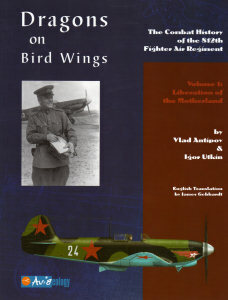 If you have any interest in WWII Soviet aviation or air combat on the Eastern Front, this book is a must-have.